Hello-Hello. I just got this W1209 temperature control switch and wanted to document all the online / offline notes properly. Let’s have fun! 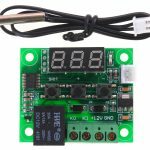 The W1209 is a low cost thermostat controller which lets you control power to most types of electrical devices based on the temperature sensed by NTC temperature sensor. Relay contats to heater/cooler via K0/K1. 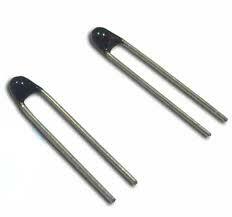 Thermistors are variable resistive elements that change their physical resistance when exposed to changes in temperature. 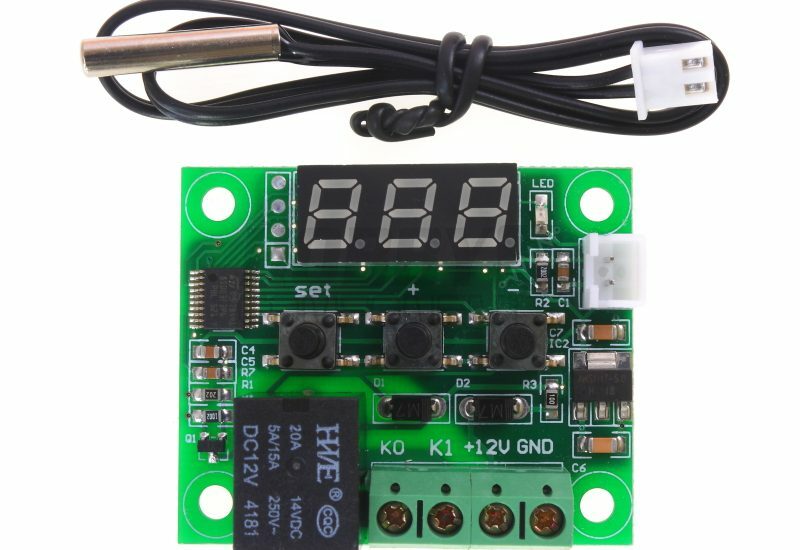 The Thermistor is a solid state temperature sensing device thats acts like an electrical resistor but is temperature sensitive. 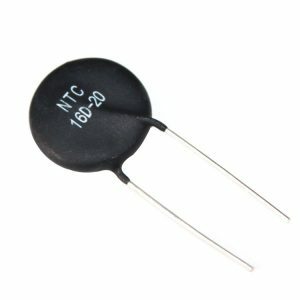 NTC stands for “Negative Temperature Coefficient”, which means that the resistance decreases with increasing temperature and are available in all sorts of packages ranging from glass beads to probes. 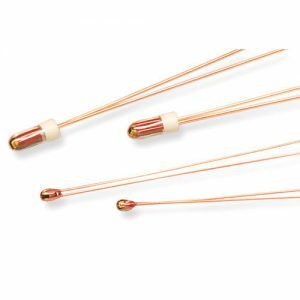 Thermistors intended for accurate temperature measurement typically have a resistance of a few thousand ohms at room temperature*. 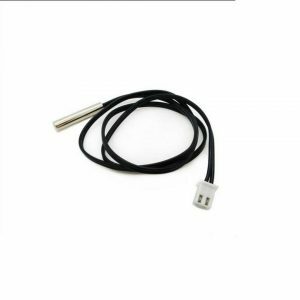 They are a good choice for temperature measurement and control in the range of -50C – 300C. The resistance exhibits a large , precise, predictable decrease as the core temperature of the resistor increases. *Indirectly related : 10K ohm resistors are most common, with a great variety of offerings, including high precision ones. They have low self-heating ( compared to 1K ohm and lower ) at voltage of 5V or so, so they can read the room temperature more accurately. Circuits that measure temperature have higher accuracy with thermistors in the 10K ohm range, because the reading is less affected by the input impedance of the measuring ciruit ( compared to 100K ohm thermistors ). 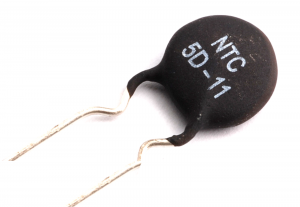 NTC thermistors are usually characterisedby their base resistance at room temperature, for example, 10K ohm at 25C. Another characteristic is the B value which is a material constant and is determined by the ceramic material from which it is made. 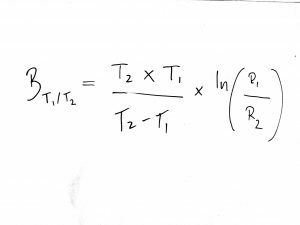 Every thermistor will have a different material constant and therefore a different resistance versus temperature curve. The first NTC thermistor was discovered in 1833 by Michael Faraday. He reported the semiconducting behaviour of silver sulfide and noticed that the resistance of silver sulfide decreased dramatically as temperature increased. Materials typically involved in the fabrication of NTC resistors are platinum, nickel, iron and oxides of silicon. They offer fast response times and allow operation at higher temperatures than the disk ones. More prone to mechanical damage. They can handle higher currents much better than bead type and have metallized surface contacts. They are sealed in airtight glass bubble and are designed for use with temperatures with above 150C. Encapsulating a thermistor in a glass improves the stbility of the sensor. Relays are electrically actuated switches. The three basic kinds of relays include mechanical, reed, solid-state relays. For a typical mechanical relay, a current sent through a coil magnet acts to pul a flexible, spring-loaded conductive plate from one switch contact to another. Reed relays consist of a pair of reeds ( thin, flexible metal strips ) that collapse whenever a current is sent through an encapsulating wire coil. A soid-state relay is a device that can be mde to switch states by applying external voltages across n-type and p-type semiconductive junctions. 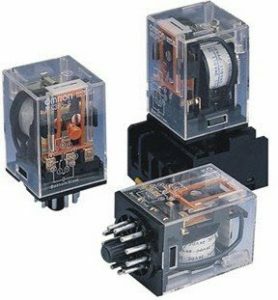 Mechanical relays are designed for high currents ( 2-15A ) and relatively slow switching ( 10-100 ms ). Reed relays are designed for moderate currents ( 500mA-1A ) and moderately fast switching ( 0.2-2ms ). Solid-state relays come with a wide rage of current rating ( from few microamps to 100A ) and have extremely fast switching speeds (1-100ns). The voltage used to activate a given relay may either be AC or DC.